I officially launched my Beauty Bag Secrets blog earlier this year but I actually bought the domain back in 2014. I’m not sure why I waited 3 years to start blogging again but the timing has just felt right this year. I know you are probably thinking ‘What does any of this have to do with your evening skincare routine woman?’ but hear me out. Over the last decade I have developed a healthy interest (and by healthy interest I mean obsession) for skincare products. I have slapped more lotions and potions on my face than you’d find in a witches brew (I know my husband will giggle at that sentence and probably whisper under his breath that I should take my broom with me on the way out). I digress. Secretly I like to think that most woman are rubbish at skincare routines. Naturally this is only so that I can make myself feel better for all those nights I have gone to bed with a full face of make up on, only to wake up the next morning looking like a troll who has aged 10 years overnight. 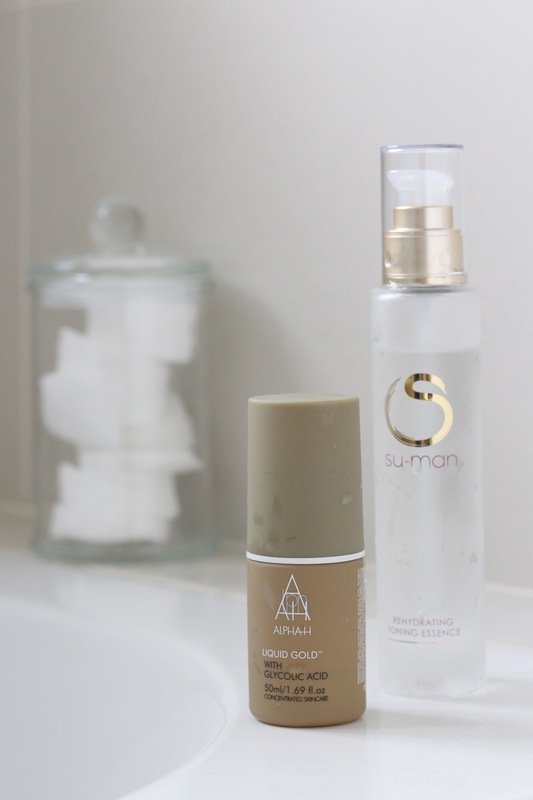 Creating this blog has not only encouraged me to find new and exciting brands to put to the test but it has also allowed me to figure out what works for my skin and it certainly helps me stick to it. The fun part is blogging about my experiences and sharing what I love about beauty. It was only earlier this year when I introduced micellar cleansing water in to my skincare regime. Come to think of it, it was probably around that time that I started double cleansing religiously. I had no idea how much residue was left on my face after a first cleanse. If you don’t double cleanse, do yourself a favour and run a cotton pad over your face after your first cleanse. With the best will (and cleanser) in the world you’re bound to have residue and if you don’t then you are using oven cleaner, I’m sure of it. 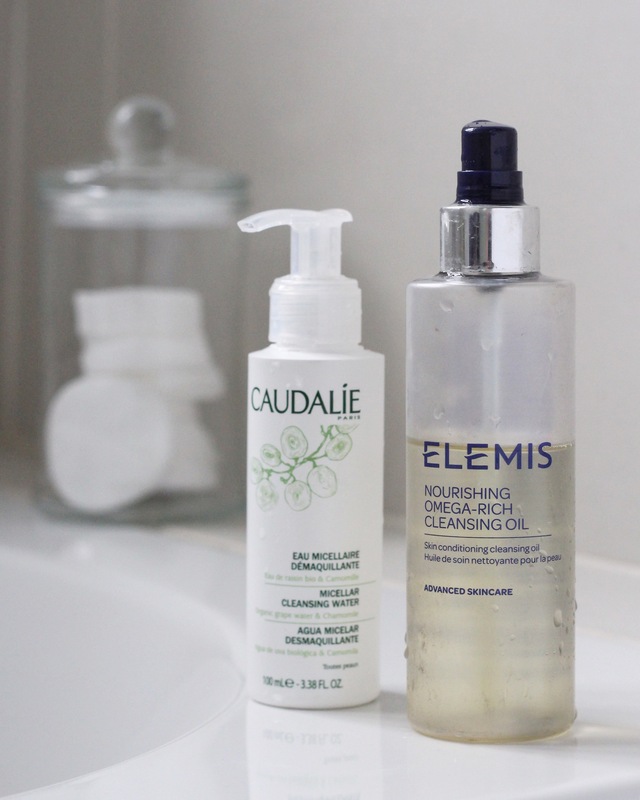 My first cleanse is the Caudalie Micellar Water. This kicks starts my evening routine and removes the initial layers of dirt and grime London has dished out over the course of the day. This power house has been part of my routine for a while now. I find an oil based cleanser works well as a second cleanse and this beautifully crafted cleansing oil brings together an exciting mix of ingredients. The texture is incredible and the product literally glides on to my skin effortlessly, removing the last traces of makeup. Blended with 90% natural oils this cleanser is delicate on my skin yet delivers on the job. 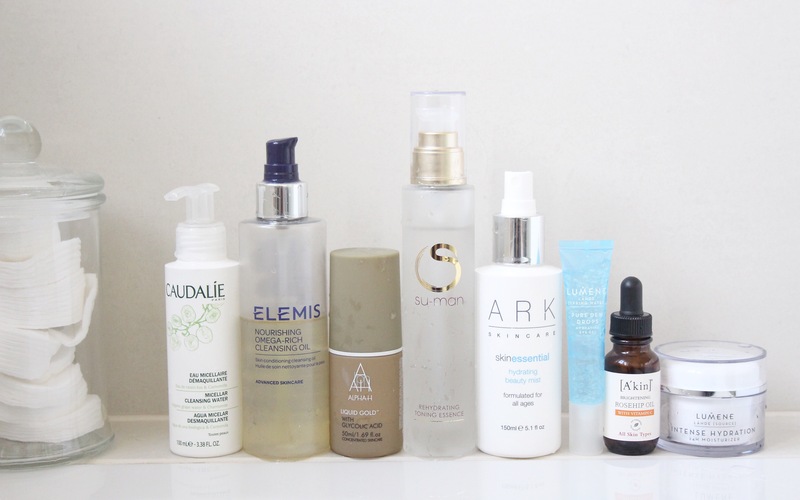 I do have fairly sensitive skin, so for me to be able to use an acid in my evening routine actually impresses me. The Glycolic acid in the formulation acts as a resurfacing tool for your skin while the liquorice extracts soothes the skin. I use this no more than 3 times a week and usually alternate between this and a silky soft toning essence from Su-man. I fell in love with this product a few months ago when I was sent some PR samples for review purposes. The fresh minty smell is absolutely gorgeous. I’ve included this in to my evening routine as I feel that London really does take it out of my skin during the day. The central heating on the train, in my office and at home tends to dry my skin out so I like to add in additional hydration where I can. I use two sprays of this Hydrating mist after cleansing. Earlier this year I was on holiday in Finland and one of the things I have started doing (when I am fortunate enough to visit another country) is to sample some of the skincare different countries have to offer. I saw this brand and ended up buying a Micellar Cleansing Water, the Pure Dew Drops and a Moisturiser. I love the gel consistency of this eye cream and when I am struggling with puffy eyes I pop this in to the fridge overnight and apply that for a cooling and soothing affect. On a side note, I have a question for all you beauty bloggers. At what point do you apply eye cream in your routine? I’ve read article upon article and have found conflicting information so I’ve gone for what works for me. I add my eye cream after toning and before any face oils and moisturisers. If my eye had a heavier consistancy than my moisturiser, I would probably apply it after based on other blogs I have read. I’ve opted for a face oil as the ‘treatment’ product in my evening skincare routine. 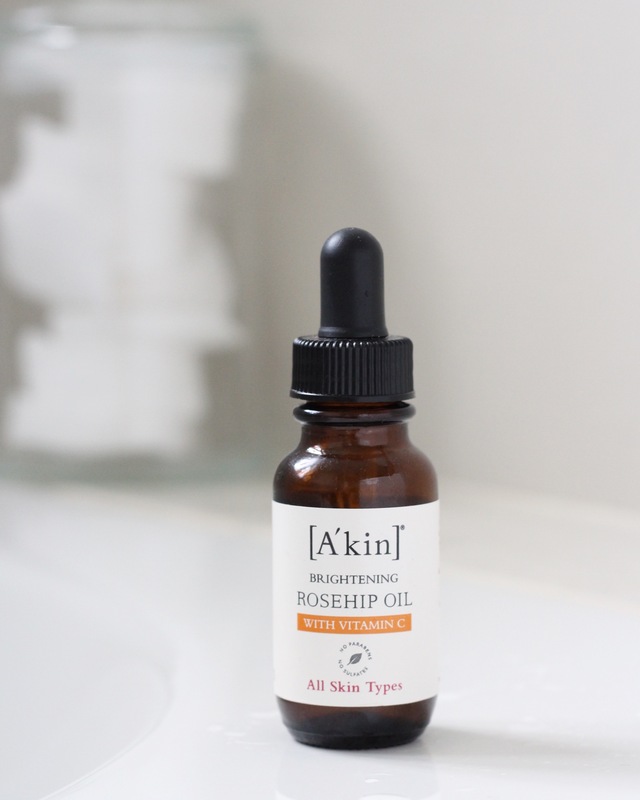 The A’kin Brightening Rosehip Oil is great. This one in particular has added Vitamin C which is a natural antioxidant but also very necessary for collagen production. 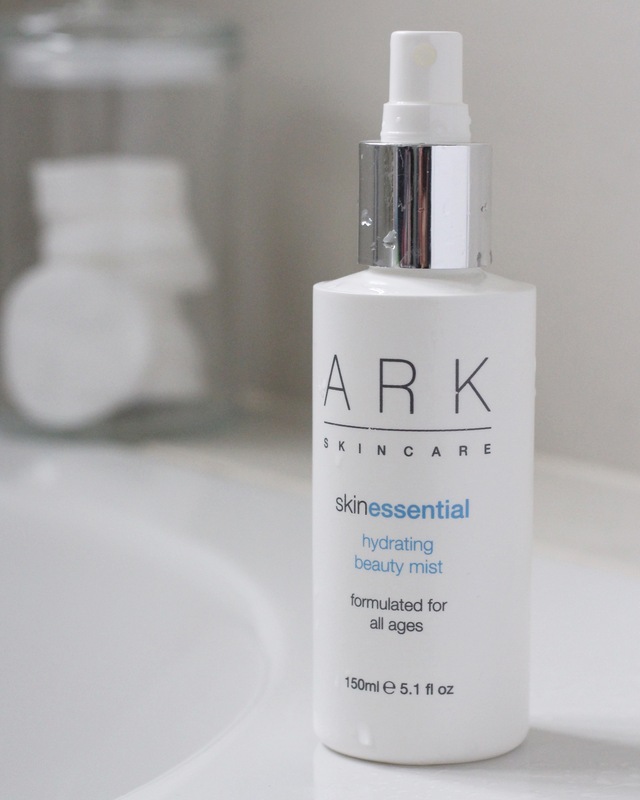 With my Hydrating mist going on first, followed by this fantastic face oil it certainly helps lock in the moisture too. Considering it is a face oil it doesn’t leave my skin feeling oily. I know that sounds ridiculous. 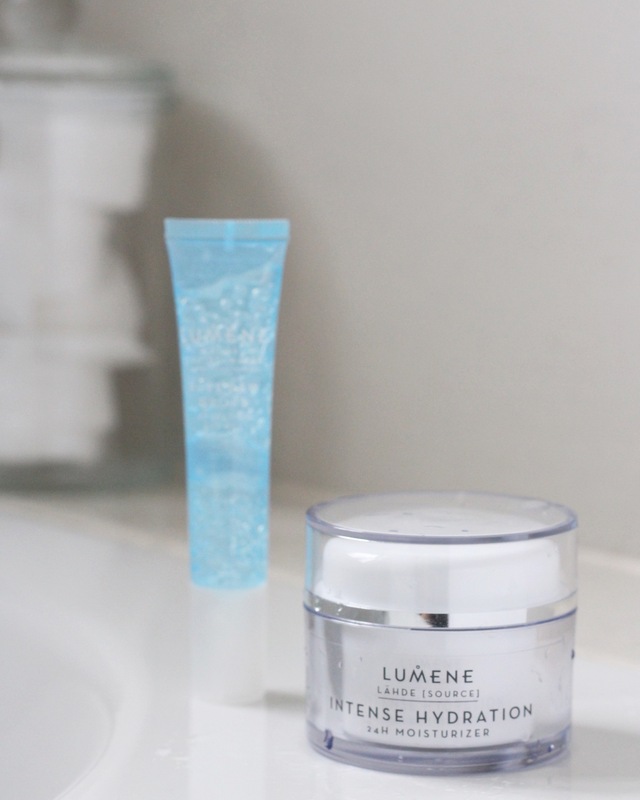 I finish my evening routine with this lightweight cream which contains Pure Artic Spring Water. Finnish water quality has long been rated as one of the purest in the world so I feel that this moisturiser definitely packs a punch when it comes to hydration. I love the texture so much that I use it as both my morning and evening moisturiser. Once a week I add in a mask but that’s worth a blog post on its own! So there you have it, my evening routine. I’d love to know which skincare products you are currently using and any that you would recommend. Also would you change the order of mine? I woke up Monday morning after my weekend away so sleepy I couldn t bear to think of doing anything beauty-wise skincare, makeup or hair before work. I’m the worst in the morning but definitely make up for it in the evening.